New Year, new beginnings. But for a drone owner from Seattle, the beginning of 2017 probably wasn’t what he was hoping for. On New Year’s Eve, his drone was circling around the Seattle’s iconic Space Needle, when it crashed onto the platform. The case was reported to the police, and it seems they identified the drone owner. The police are still working on the case,and the City of Seattle could file charges. In this case, the owner may pay a fine and even end up in jail. The drone was hovering around the observation deck, when it crashed onto a platform near the bottom of a holiday light display. There were several people working on the platform, and fortunately, no one was hurt. Considering that this is the biggest tourist attraction Seattle, it’s really pure luck that not many people were on the platform that day. The building also wasn’t damaged in the crash. The management of the Space Needle filed the report to FAA after the incident. However, they told them they needed to make a report with local authorities first. This is why the drone wasn’t turned to police until January 10. Seattle police is currently investigating the incident, but a source confirms the owner was identified through the drone’s serial number, because of the mandatory FAA registration. The Seattle Attorney’s Office says the city doesn’t have a statute that limits drone use. Also, they cannot charge the pilot for hurting someone or damaging the tower. However, they could charge him with reckless endangerment. If charged with this, the drone owner might face a penalty of up to 364 days in jail, and up to $5,000 fine. It’s not clear whether the drone owner was filming for commercial or private purposes. Here you can see the whole video, and the crash happens around 2:18. I wonder how it happened – was it the wind, did the pilot lost control over the drone, or something else? 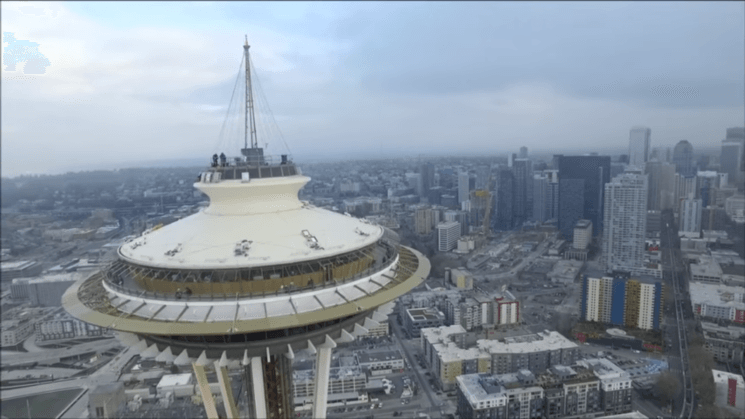 This is the third time the Space Needle employees recovered the drone on their property. Space Needle CEO Ron Sevart made a joke that “it looks like the drone tractor beam [they] installed on the Space Needle is working”. But I believe that, facing a year-long prison sentence, the drone owner doesn’t really feel like joking. How do you think this happened? And do you think a year in prison is too much (or too little) for this incident? Crashing a drone is like throwing an empty soda can at the building. There was likely no damage, no nefarious plans, it was an accident. He probably didn’t get a permit and will just be cited for that. Nothing really to see here. The Space Needle has a jammer specifically for drones so it was not pilot error. One of the articles about this event mentioned it. He’s lucky it crashed on top and didn’t fall and hit somebody on the ground. He won’t go to prison. Any sentence up to 364 days is served in a county jail, and under sentencing guidelines, he probably won’t do any time if he doesn’t have a prior criminal record. FWIW.